Sports fans should know that all good things must come to an end. Every championship team struggles. But Atlanta United is not just suffering a post-championship slump; the team is crashing and burning. Coming into their April 20 home game against FC Dallas, Atlanta was hoping to capitalize on momentum after their first win of the season against New England. Despite firing 22 shots, eight of which were on target, Atlanta lost 2-1 to an exceptional FC Dallas team. FC Dallas immediately put Atlanta on their heels by scoring in the sixth minute. After FC Dallas played the ball out from the defense, midfielder Michael Barrios spun away from Atlanta defender Leandro Gonzalez-Pirez, leaving the Argentinian in the dust following a mistimed slide tackle. Barrios burst down the right wing with great agility and speed, and Atlanta defender Brek Shea sprinted in vain to intercept him. Barrios fired a perfectly placed pass toward his compatriot and teenage forward Jesus Ferreira, who calmly controlled the pass and slotted the ball past the outstretched foot of Atlanta goalkeeper Brad Guzan and into the goal. The noise level dropped substantially from the Atlanta faithful, stunned to see their team concede a point so early in the match. But Atlanta attempted to fire back when the ball found midfielder Ezequiel Barco from a corner kick in the 25th minute. Barco smashed a curling shot from outside of the goal box square off the post, but Atlanta could not score off the rebound. Before halftime, FC Dallas almost extended their lead. FC Dallas defender Reto Ziegler hit a strong free kick from distance, but Guzan made a solid diving stop to keep Atlanta in the game. During the second half, Atlanta played better and created many goal-scoring chances in attack. Unfortunately, they couldn’t put together the finishing touches. Atlanta midfielder Julian Gressel hit a curling free kick in the 50th minute, but FC Dallas goalkeeper Jesse Gonzalez dived to make the save. Barco again hit the post off of another free kick in the 60th minute. Barco’s powerful, bending free kick clipped the top of the crossbar in a manner that would impress free-kick maestro and former LA Galaxy midfielder David Beckham. Atlanta searched for an equalizer and twice came agonizingly close through forward Josef Martinez’s efforts. In the 81st minute, Gonzalez made the best save of the night to deny Martinez’s close-range shot directly from a corner kick, displaying lightning-quick reflexes and dropping down to save the low shot. Then, in the 86th minute, Atlanta midfielder Gonzalo “Pity” Martinez lobbed a pinpoint pass to Josef Martinez, who darted behind the FC Dallas defense. Despite being one-on-one with Gonzalez, Josef Martinez hit his shot just wide to the disbelief of Atlanta fans and commentators alike. Gonzalez played a huge role in FC Dallas’ win as the 23-year-old stepped up to the challenge with seven saves. FC Dallas took advantage of Atlanta’s aggressiveness and scored on a counterattack. Barrios found a lobbed pass, and in a display of speed and accuracy, the midfielder earned his second assist with a pass to midfielder Bryan Acosta. Acosta sprinted 75 yards down the center of the field — leaving Gonzalez-Pirez in the dust yet again — to score the tap-in goal. Gonzalez-Pirez’s faulty positioning was a major factor in both of FC Dallas’ goals. Despite the frustrations in offense, Atlanta United got a consolation goal in stoppage time, and Josef Martinez finally ended his 436 minute goalless run with a well-placed penalty kick. In tight games like this one, Josef Martinez’s misses and Barco’s shots off the post are costly. Yet manager Frank de Boer was still very happy with his team’s performance and insisted that wins will come if Atlanta continues to play with the same attacking intent. Despite de Boer’s optimism, fans’ patience is wearing thin. Goals have continued to elude his team despite several good chances. Atlanta holds the unwanted record of the least amount of goals scored in the MLS Eastern Conference, which should be especially painful for the Atlanta faithful since the Five Stripes scored the most goals in the entire MLS last season. Fans have expected the 2018 MLS Golden Boot winner Josef Martinez to assume responsibility, but he has failed to step up and take control of games in the same manner as last year. While Atlanta may have attacking potential, that alone does not win championships. Unless de Boer can start guiding Atlanta to more victories and goals, his tenure with a new team may be cut short yet again. After the departure of former Atlanta United FC Head Coach Gerardo “Tata” Martino, uncertainty surrounded Atlanta United. And to make matters worse, Martino’s replacement, Frank de Boer, has given credence to the uncertainty. Under de Boer, Atlanta has failed to record a win in Major League Soccer (MLS) after four games this season and currently rank at the bottom of the Eastern Conference. Given that de Boer was fired from his last two managerial positions after failing to get early results, the manager has a mountain to climb to ensure Atlanta United is not yet another one of his failures. Even by the standards of an average MLS team, Atlanta is off to a nightmarish start in 2019. The team lost their opening game to D.C. United 2-0, tied two games in a row at home and were most recently shut out by the Columbus Crew SC on March 30 with a score of 2-0. Atlanta’s underwhelming results pale in comparison to United’s four wins in their first five games at the start of the 2018 season. Moreover, Atlanta has not gone three games without a win since the 2017 season. In the face of skepticism from the media and fans regarding de Boer’s managerial pedigree, de Boer has thrown gasoline into the fire by suggesting that United fans are spoiled after the unprecedented victories of the past. Although de Boer later apologized for the error in translation from Dutch to English, Frank de Boer has a dubious managerial record that will not offer encouragement to the Atlanta faithful. De Boer recently become infamous for first getting fired after 85 days in charge of Inter Milan in 2016, and then getting the boot after a record five Premier league matches as manager of Crystal Palace F.C. in 2017. There was bound to be an adjustment period after Atlanta lost arguably one of the most overqualified MLS managers in history, and United have struggled to adjust fully. Whenever a new manager is hired, their new tactics often clash with the former manager’s approach. Managers want to assert their own influence on the team rather than simply copying their predecessor. As such, Martino’s successful attacking style has turned into a slower, possession-based approach. It is unclear if de Boer intentionally changed Atlanta into a possession-based team, since he admitted that he did not want to drastically change Martino’s attacking tactics. Despite managerial failures, de Boer was undoubtedly a legendary defender for teams like Ajax, Barcelona, and the Netherlands National Team, while notably he served an immaculate cross-field pass for arguably the best World Cup goal ever as the Netherlands beat Argentina 2-1 in the quarterfinals of the 1998 World Cup. De Boer must draw from his experience excelling against the footballing elite, in addition to his managerial achievements with Ajax, guiding the team to four straight Eredivisie (Dutch league) titles, in order to steer Atlanta back to winning ways. Dutch “Total Football” will undoubtedly influence de Boer’s efforts to recapture success. Total Football encourages positional versatility, maximum possession of the ball and frequent passing, while Martino’s style did not emphasize possession but rather quick, rapid counterattacks. Unfortunately, Total Football does little to defend against the claim that soccer is just kicking a ball around with no purpose, and for non-traditionalist fans, games can become boring. That being said, an evolved version of Total Football nicknamed “tiki-taka” did help the Spanish national team lift their first-ever World Cup in 2010. However, unlike Spain, the results have not yet come in for Atlanta, and the squad has struggled to adapt to de Boer’s Total Football. Former U.S. men’s national team defender Alexi Lalas perfectly summed up Atlanta United’s situation on his State of the Union podcast. Despite de Boer’s experimenting with formations, from playing three defenders in a 3-4-3 or 3-5-2, the forwards have looked flustered. Prolific goal scorer and forward Josef Martinez has been starved of passes, while midfielder Gonzalo “Pity” Martinez has been forced to take questionable shots outside the penalty box, unable to find passing lanes or penetrate opposition defenses. Not only has Atlanta United failed to win, but the Five Stripes have lost their trademark incisive attack. Atlanta fans had become accustomed to watching their midfielders unleash rapid counterattacks with perfectly placed passes while their forwards dribbled past any defense to score with clinical accuracy. This offensive firepower is what captivated fans and gained the team victories, and United direly needs to reignite it if they wish to salvage this season. In their first four games, Atlanta has scored a dismal two goals, tied for worst in the MLS. Unlike other teams such as Atletico Madrid that can scrape by with boring 1-0 victories through solid defense, Atlanta United does not have the same defensive talent to secure victories with such close scoring margins. Overall, United has built a brand of smashing expectations and records. De Boer will not last long if his playing style does not get the same accolades as Martino’s. The expectation from Atlanta fans is high, but de Boer should have realized that Atlanta fans crave success and will fervently support their team. De Boer must rise to the occasion after accepting arguably the toughest MLS managerial position. The two-week break before facing New England Revolution on April 13 will be a welcome relief. During that time, de Boer must reflect on the team’s failures and build a plan that optimizes their offensive strengths, even if that comes at the expense of his own possession-based coaching philosophy. Much to baseball fans’ chagrin, Americans seem to love soccer just as much as “America’s pastime.” According to a 2018 Gallup poll, Americans name soccer as their favorite sport within 2 percentage points of Americans who name baseball. This love of soccer has Americans investing more resources into Major League Soccer (MLS) academies capable of developing elite players. Despite all this, the men’s trophy count has been lackluster. But American fans still have a World Cup-winning squad to root for: the U.S. women’s national team (USWNT). Disaster struck the men’s team in 2017. Trinidad and Tobago, a country over 50 places below the U.S. men’s national team (USMNT) in FIFA rankings, defeated the USMNT, meaning the U.S. failed to qualify for the 2018 FIFA World Cup for the first time since 1985. Also in 1985, the USWNT played their first competitive game and has since grown into one of the most powerful dynasties in all of American national sports. In 30 years, the USWNT has won three World Cup trophies and four Olympic gold medals and. The USWNT is the most successful team in both premier sporting events, while they have dominated the FIFA women’s rankings in the 21st century. They’ll look to continue their leading performance in this summer’s FIFA Women’s World Cup. In stark contrast, the USMNT has never won a World Cup in over 100 years of competing. The USMNT achieved their highest ranking of fourth place in 2006, and the team currently sits in 25th. Disregarding FIFA’s questionable methodology in obtaining those rankings (some question why Switzerland is ranked higher than Spain), the USMNT has consistently underperformed. So why is the women’s team so much better relative to the men’s team? On the one hand, women’s soccer is somewhat less competitive than men’s soccer. Women’s soccer features 50 fewer FIFA ranked national teams than men’s. While the USMNT would be happy with a draw against any of the top 30 teams, the USWNT considers any result other than a victory against any team as a failure. Additionally, Title IX, the 1972 civil rights legislation enacted to increase gender equality in college education, has provided scholarships to players looking to eventually turn professional. As a result, U.S. women’s soccer has a tremendous competitive edge in their consistent stream of talent compared to other countries such as Spain.. In 2018, the U.S. had over 1 million youth female players, whereas Spain had just 20,000 players. Funding shortages are a major issue for such footballing giants like Spain or Brazil that lack similar Title IX policies. Brazil’s men’s team has won a record five World Cup trophies, while the women’s team is the most successful women’s team in South America with six Copa America trophies. Yet the Brazilian women’s team have still had to deal with a lack of resources despite their success. Former Brazilian women’s team captain Aline Pellegrino struggled with institutional gender discrimination and eventually quit the team for a steady paying job. So in contrast, credit must be given to the American government for supporting women’s athletics. And that support isn’t just institutional, as the 2015 Women’s World Cup final became the most-watched soccer game in U.S. television history. Despite this massive achievement for women’s sports, debate still remains over how to provide the USWNT the same level of marketing and pay as the USMNT with the greater global demand for men’s soccer. But why has the USMNT failed to impress for much of its existence? For one, the talent pool has been plagued by bureaucratic power struggles and needless inefficiency. At the heart of this issue are lower-division soccer organizers like the National Premier Soccer League (NPSL), American Soccer League (ASL) and United Premier Soccer League (UPSL), who have fought bitterly to monopolize the talent stream into the USMNT rather than to collaboratively coexist. Moreover, when American soccer organizations and teams disagree, they sue with remarkable ease and further polarize opposing parties rather than negotiate terms for the greater good of American soccer development. The USMNT has also not matched their female counterparts because of their culture of complacency. Unlike the USMNT, the USWNT has constantly had to fight for equal status in the U.S., whether it be for equal playing conditions or equal pay. This fighting mentality has become ingrained in the women’s team. Some USMNT players and coaches have admitted that a lack of motivation and fighting spirit are reasons why the team failed to qualify for the 2018 World Cup. “After having been with U.S. Soccer after 30 years, it’s disappointing to me that it seems that we’ve lost the fight for the last three or four years,” former USMNT Assistant Coach and then-USMNT U-20 Manager Tab Ramos said, speaking to ESPN in 2018 about USMNT’s failure to qualify for the 2018 World Cup. When the team failed to qualify, some critics argued that the USMNT relied too much on retaining aging players at the cost of developing talented youth. Without younger players to challenge them, the veterans grew complacent. However, since the wake-up call loss to Trinidad and Tobago, the USMNT has made notable progress in youth development. The revitalization of the squad resulted in promising results against major national teams, including a pair of 1-1 draws against 2016 European Champions Portugal in November 2017 and against 2018 World Cup Champions France in June 2018 (notably, many of those same French players starred during the World Cup). MLS academies have invested more resources into developing youth talent and as a result, the USMNT now features more young and skilled players. Stars like Christian Pulisic (who recently signed for Chelsea F.C. in a fee that made him the most expensive American soccer player ever) and a wave of American youngsters are getting valuable experience playing in more competitive leagues abroad. Overall, American soccer fans can be optimistic U.S. teams can bring home more trophies. The USWNT is in a great position to defend their 2015 Women’s World Cup title, currently occupying the top FIFA ranking. Moreover, the USWNT was drawn into a favorable group, with Sweden being the only serious threat to the USWNT getting past the group stage.The USMNT should look to recent underdogs and 2018 World Cup finalists Croatia as proof that soccer is fueled by both belief and talent. If the USMNT qualifies for the 2026 World Cup, the support of American crowds will majorly factor into the USMNT’s success. The 1994 World Cup, the last edition hosted by the US, smashed numerous World Cup attendance records en route to becoming the most attended World Cup in history. The support of American fans played a role in the US advancing to the round of sixteen for the first time 23 years ago. Despite historical failures, given the modern American passion for soccer and the rise of young prospects, the USMNT is on course to redefine American soccer and potentially has the best chance to make their most successful run in any World Cup in 2026. As the gold confetti and red smoke cleared, Atlanta United fans could hardly believe their eyes: the Five Stripes won their first Major League Soccer (MLS) Cup in only their second season of existence. Head Coach Gerardo “Tata” Martino delivered the most deserving of parting gifts to United fans, going into the final as the future coach of the Mexican national team. Martino’s replacement, Dutchman and former defender Frank de Boer, has endured an inconsistent beginning to his managerial career. Despite the team’s retention of key players (such as forward Josef Martinez), Atlanta faces a difficult task to defend the MLS Cup. It was always going to be a challenge to replace Martino, the 2018 MLS Coach of the Year, and attract an elite coach to the notably less competitive league. When news broke that Martino would be leaving after the 2018 season, Atlanta fans were justifiably concerned that Martino would be irreplaceable. Atlanta lost the maestro that orchestrated an incisive, counter-attacking style of soccer that has drawn in record crowds. Their entertaining brand of soccer made United arguably the most exciting MLS team. Frank de Boer is charged with the tough task of replicating Martino’s unprecedented success. To his credit, de Boer is a veteran of elite soccer and has tremendous expertise from which to draw. He has experience playing for world class teams like the Dutch national team (tallying the third most appearances ever for that team) and F.C. Barcelona, and has extensive managerial success with top Dutch club team Ajax. However, even de Boer’s most passionate supporters will admit that his recent managerial profile is bleak. The Dutchman made headlines in 2017 after he was fired from Crystal Palace, who plays in the Premier League, after the team started the season 0-4 and scored no goals. His four game managerial tenure was the shortest in Premier League history. Despite his recent failures, de Boer has had success as a manager after guiding Ajax to a record four Eredivisie titles in a row. Moreover, the higher quality of opposing teams in Italy and England, and the relative misfortune of de Boer’s firings (some believe he was fired too early), paint an unfair picture of de Boer’s potential in the substantially weaker MLS. United fans can be encouraged by de Boer’s experience as assistant manager to the Netherlands national team (assisting in their second-place finish in the 2010 World Cup). Also, in a promising interview with ESPN, de Boer emphasized his desire to keep fans entertained and to obtain international success by winning the coveted CONCACAF Champions League. Despite the managerial change, Atlanta has a largely unchanged roster for the 2019 season. Goal scoring machine Josef Martinez will lead the attack for 2019, and is committed to Atlanta until 2023 after signing a massively important five year contract this month. Amid reported offers from top European teams in 2018, Martinez committed to Atlanta United in a decision that bodes well for the reputation of the MLS. The MLS has faced criticism for becoming a league for aging European players, and for not fostering and retaining young talent. Talking about his contract extension, Martinez called it his “dream” to stay with Atlanta. Martinez added that the people of Atlanta had won him over with their “affection,” making it clear that he values the passionate Atlanta fans and is motivated by their support. Additionally, forward Julian Gressel is in the process of signing a long-term contract, and his contribution is critical to Atlanta’s success. The German registered 14 assists last season, and his ability to play multiple positions in attack, midfield and defense made him a vital team player. Goalkeeper Brad Guzan has shown no indication of leaving, while team captain and defender Michael Parkhurst will also return for the 2019 season. United looks well set to continue to have one of the most impenetrable defenses in the MLS. However, playmaker and midfielder Miguel Almiron, the Robin to Martinez’s Batman, has not signed an extension with United. The Paraguayan and Atlanta’s highest paid player is a match-winner for Atlanta, both with his ability to score goals and create assists, but that talent has also caught the attention of elite European teams. It remains to be seen if Atlanta possess the financial ability to keep Almiron, given the high demand for his services. Overall, it will be more difficult for Atlanta to retain the MLS Cup than it was to win the 2018 title. United must retain Martino’s attacking philosophy that has struck fear into the MLS in order to become the fourth team to win two consecutive MLS cups. United boasts a talented roster with skilled replacements at almost every position, but it is unclear if de Boer possesses the skill set to utilize the team in the same way Martino could. With United’s remarkable fan support and star performances from players like Martinez and Almiron however, few bookies would bet against the Five Stripes. Atlanta United FC cruised to a comfortable 3-1 aggregate win in the second leg of the Eastern Conference Finals on Nov. 29 at the Red Bull Arena in Harrison, N.J. United’s 1-0 loss to the New York Red Bulls did not impact the aggregate score, allowing them to finally win some silverware to support their domestic success. Importantly, United got revenge on their conference rivals after the Red Bulls snatched the Supporters’ Shield from Atlanta’s grasp on the last day of the regular season on Oct. 28. At long last, United finally rewarded their diehard fan base and followed up their remarkable success in the regular season with a well-deserved Eastern Conference Championship trophy. Just 12 seconds into the game, Atlanta forward and talisman Josef Martinez had a golden one-on-one opportunity with Red Bulls goalkeeper Luis Robles. But Robles made a brilliant point-blank save to deny Martinez. Martinez lost the chance to effectively end the game and silence the boisterous New York crowd. While a 4-0 lead would be insurmountable on its own, the official MLS rules favor away goals over home goals. If Martinez had scored, then the Red Bulls would have needed five goals to win the conference title on aggregate score. Again, Atlanta preceded their phenomenal attacking reputation and pushed for the contest-winning goal. In the 20th minute, midfielder Julian Gressel fired a low, long-range shot outside the box, but Robles made a full dive to push the shot wide. One of the few bright spots in the Red Bulls’ disappointing performance, Robles played brilliantly, making four saves to keep New York in the game and give the home crowd some hope until the final whistle. In the second half, New York enjoyed some promising possessions, and looked poised to score a goal as they closed in on Atlanta’s goal. In the 51st minute, the Red Bulls missed the opportunity they needed to give them a realistic chance of winning. The attacking move started when forward Daniel Royer played an incisive pass into the goal box to fellow forward Alejandro “Kaku” Romero. Then, Kaku hit a low, driven cross toward goal, with one of the best passes of the game. That is, until New York appeared to score in the 80th minute. Kaku again was at the center of the action when he delivered a lackluster cross to nobody in particular. But, when Atlanta tried to head the ball out of the box, the ball looped into the air. Atlanta goalkeeper Brad Guzan came out to punch the ball to safety. But he only proved that goalkeepers should stay away from professional boxing when he punched the ball straight up. On the second chance, Guzan tried to catch the ball, but New York defender Aaron Long headed the ball out of Guzan’s hands and into the net. Guzan and Atlanta were furious. Since Guzan appeared to have control of the ball, and jostling with the goalkeeper after he or she has possession of the ball is against the rules, the Red Bulls had not scored a legitimate goal. The video review system (VAR) was used to examine the goal, and the technology overturned the New York goal. While the review made the correct decision, the outcome was tough for the Red Bulls as this was their second goal of the conference finals ruled out by VAR. However, the Red Bulls would not back down. New York stole Guzan’s clean sheet when they scored from a corner in stoppage time. The ball landed awkwardly in front of Guzan, but when neither the Atlanta defense nor he attempted to clear the ball, New York defender Tim Parker poked the ball into the net. But with only one minute left to score two points, the goal was one of the most anticlimactic of the entire MLS postseason. Not a single Red Bulls player celebrated as they knew the result of the game was a foregone conclusion. Atlanta will be giddy with excitement when they host and contest the MLS Cup on Dec. 8 at 8 p.m. at the Mercedes-Benz Stadium. Importantly, outgoing Atlanta United Head Coach Gerardo “Tata” Martino will look to end his reign by winning the most coveted trophy in American soccer in his final game with United. In 2017, Atlanta United FC played its inaugural MLS season and the team immediately won the hearts of native Atlantans and casual MLS supporters alike. Equipped with owner Arthur Blank’s keen business sense, United built a southern soccer dynasty that has dazzled the league with their attacking firepower and their entertaining brand of soccer. While the 2017 MLS Cup evaded their grasp in their first season (narrowly losing to Columbus Crew SC on penalties), it was unprecedented for an expansion team to advance as much as United did. Moreover, the club took pride in being named by Forbes as the most valuable MLS franchise in only their second season, worth about $330 million. But Blank has not broken the bank on established superstars (consider former midfielder David Beckham’s $30 million deal with Los Angeles Galaxy), and he has fostered a successful team culture with immediate results rather than building a team driven by individual talents. As a testament to their team rather than individual success, Atlanta United players have five of the top 25 best-selling MLS jerseys according to Forbes. No other team has more than three. To put their astonishing success in perspective with European teams, Atlanta United has drawn more fans to their games than five-time Premier League champions Chelsea FC. Although they narrowly lost to Columbus Crew SC on penalties last year, Atlanta is in prime position to make a deep run in the playoffs this year after narrowly missing out on the Supporters’ Shield to the New York Red Bulls in their second season. One of the key factors to Atlanta’s success has been Blank. Throughout his investment in United, Blank has emphasized six core principles through his philosophy, according to Inc.
“Put people first, listen and respond, include everyone, innovate continuously, lead by example and give back to others,” Blank said. Leading by example, Blank was determined to build a successful team with a talented squad, experienced coach and veteran administrative staff. United turned the collective heads of international football when they signed former FC Barcelona manager Gerardo “Tata” Martino. After just two seasons with the team, Martino’s success with Atlanta earned him the manager position on the Mexican national team according to ESPN. Martino will leave after United’s postseason run as a club legend, having established a remarkable precedent for success and making the playoffs in both of his seasons in charge. Martino has groomed forward Josef Martinez and midfielder Miguel Almiron into world-class players capable of excelling in top European leagues. Blank also recruited former Tottenham Hotspur F.C. executive Darren Eales. With experience at one of England’s most successful teams, Eales dedicated himself to building a solid team foundation for the MLS newcomers. Before United even began playing, Eales spent about five days per week scoping out Atlanta bars and pubs — which he jokingly dubbed “Pub Crawl Our Way to Success” — to connect with the community and explore ideas about how to market the club effectively. While Atlanta is not nationally known as the best sports city, Blank seeks to change that. For one, United defied the MLS trend to splurge on veteran, established stars who carry the team. For example, Orlando City SC signed former Ballon d’Or winner (awarded to the best soccer player in the world) and Real Madrid midfielder Ricardo Kaka to kickstart their entrance into MLS in 2015. But despite Kaka’s presence, the team failed to make the playoffs. Moreover, Blank has overseen remarkable success in organizing his team like a startup by investing in players with great potential and earning the trust of fans. For instance, United’s key marketing campaign features the motto “Unite and Conquer,” in which United players are featured with “Conquer” and fan photos accompany “Unite.” The campaign is hard to argue against in terms of building unity and passion in the team. United’s striking playing style has also factored substantially into the club’s success and huge fanbase. In an interview with The New York Times, Eales emphasized that the club wants to prioritize playing exciting soccer games to draw in fans and create a passionate fan atmosphere. This approach contrasts European teams like Atletico Madrid, which are known for winning at all costs, even if the fans get bored by a 1-0 scoreline. Atlanta has consistently delivered on its promise, with Almiron and Martinez frequenting the goal and assist leaderboards. Fans have shown their gratitude at home games with arguably the most passionate and vocal supporters section in the league. Atlanta only lost twice at the Mercedes-Benz Stadium in the 2018 season, tied with three other teams for the least number of home losses. This phenomenon creates a sporting symbiosis that fuels game excitement and fan passion. After beating the Red Bulls 3-0 in the Eastern Conference Final first leg, United are well on their way to rewarding their diehard fan base and intelligent management with silverware this season. Atlanta will look to book their place in the MLS Cup final with the second leg of the Eastern Conference Final against Red Bulls on Nov. 11. The No. 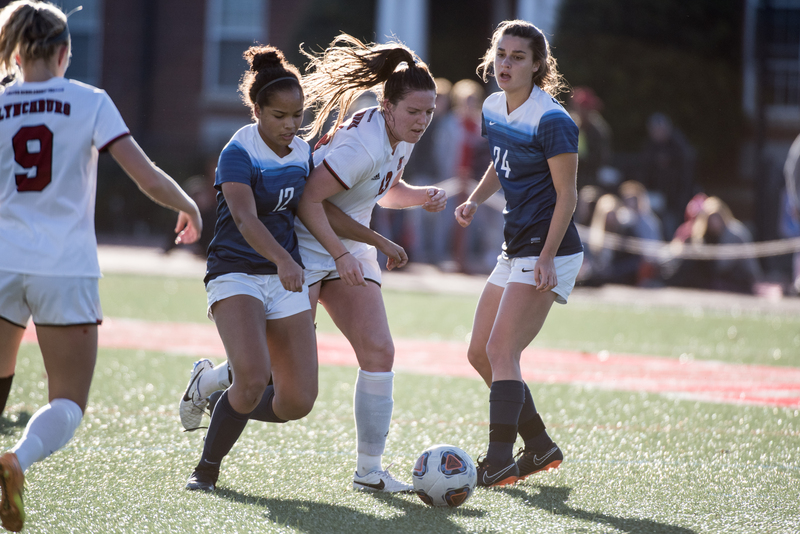 22 Emory women’s soccer team kicked off its first post-season run since 2013 on Nov. 10 and 11 in the first and second rounds of the NCAA Division III Women’s Soccer Championships hosted by the University of Lynchburg (Va.). 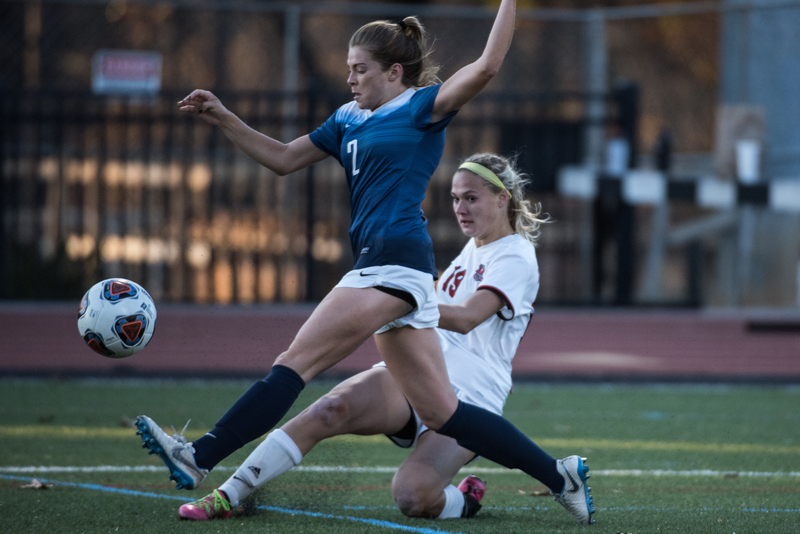 In the first round, the Eagles came out on top against the Pennsylvania State University-Berks (PSU) Nittany Lions 1-0, but suffered a heartbreaking loss in the second round against Lynchburg 2-0. In the first round match against PSU-Berks, the Eagles and Nittany Lions faced off in a dramatic back-and-forth battle. After a scoreless first half, the Eagles had three goal opportunities in the 77th minute of the second half, but they were unsuccessful in driving any home. Sophomore midfielder Samantha Hilsee’s first chance was stopped on a kick save by PSU sophomore goalkeeper Bristol Pizzuto before senior forward Sophia Dillon’s rebound ricocheted off the crossbar. 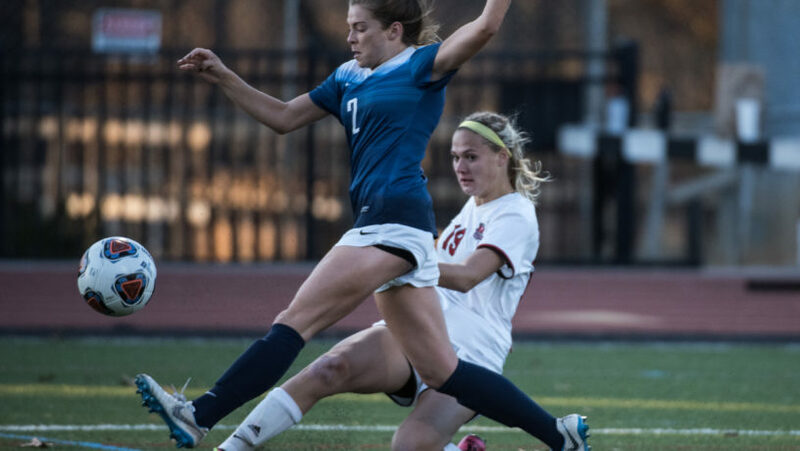 Just seconds later, sophomore defender Caroline Moore threatened PSU-Berks with a header that was saved by Pizzuto. Senior goalkeeper Dani Staffin closed out the game with 11 saves, her career second-best and fourth clean sheet of the season. Four of her saves came during the final five minutes of regulation, keeping the Nittany Lions scoreless and sending the game into overtime. Just two minutes and seven seconds into the first overtime period, senior forward Abbe McCarter fired a shot from the right side of the 18 and buried the ball into the left corner of the net, chalking up the first and only goal of the match and sending the Eagles to the Round of 32. The game-winner was McCarter’s team-leading fourth and fifth overall goal of the season. The Eagles led the match in shots 24-21, but PSU-Berks had an 11-9 edge on shots on goal. The victory extended Emory’s win streak to eight games and boosted their overall record to 14-4-1. Senior defender Danielle Darius and sophomore defender Lily Dresner both helped contain the nation’s leading scorer, PSU-Berks senior forward Caitlin Golden, who averages a D-III best 5.55 goals per game. In the second-round match against No.17 Lynchburg, the Hornets controlled possession throughout the first half, outshooting the Eagles 10-2. In the 37th minute, senior forward Caitlin Mertens dished the ball to junior forward Alyssa Rudy inside the box, allowing Rudy to bury the ball into the lower left corner. In the second half, the Eagles retaliated, applying heavy pressure up front. In the 46th minute, junior forward Caroline Kolski recorded Emory’s first scoring opportunity with a shot from the top of the 18, which Lynchburg goalkeeper Delia LoSapio deflected. In the 53rd minute, Darius rocketed a shot off a corner kick which LoSapio once again stopped. The Hornets sealed the Eagles’ fate in the 87th minute when the Eagles turned the ball over to Lynchburg senior forward Emily Sanchez who beat out the Eagle defense and finished to the top left corner. Lynchburg outshot Emory 16-11, with an 8-5 edge on shots on goal. Junior forward Shivani Beall led the Eagles with five shots and two on goal, while Kolski followed with three shots and two on goal. Staffin headed the Emory defense with eight saves. The Eagles ended their 2018 season 14-5-1, the most wins in a single season since 2013. The Hornets will go on to the Round of 16 on Nov. 17 against Messiah College (Pa.). The Emory women’s soccer team ended the regular season on a strong note with a 3-1 win over the University of Rochester (N.Y.) on Nov. 3 at Fauver Stadium in Rochester, N.Y.
With the victory, the Eagles finish the season with a seven-game undefeated streak as well as five consecutive victories. The team closed out with an overall season record of 13-4-1 and a conference record of 4-2-1, good for third place in the University Athletic Association (UAA). The Eagles’ third-place UAA finish is the best by the program since 2013. Sophomore defender Caroline Moore scored the first goal of the afternoon — and her fifth goal of the year — in the 17th minute. She tapped the ball into the right post off a cross from senior forward Sophia Dillon. The Eagles maintained their lead until halftime. Senior goalkeeper Dani Staffin made several saves to keep the score even. Her defensive prowess showed in the 54th minute when she made a double save, keeping out a penalty and the rebound. However, the Yellowjackets found an equalizer a minute later as Rochester senior forward Kerri Eden scored from inside the box. The Eagles opened the floodgates within the last quarter of the match. Freshman midfielder Lindsey Breskow scored off a deflection from a cross by junior forward Shivani Beall in the 68th minute. Sophomore midfielder Samantha Hilsee finished off the Yellowjackets in the 83rd minute with a header from sophomore midfielder Lily Dresner’s free kick. The Emory defense also impressed, not allowing another shot on target during the last 28 minutes. The Eagles heard new good news Nov. 5 as they earned a bid to the NCAA tournament for the first time since 2014. This will be the Eagles’ 17th overall appearance and ninth under Head Coach Sue Patberg. The Eagles will face Penn State Berks in the first round of the NCAA tournament at 3:30 p.m. on Nov. 10 in Lynchburg, Va.